What Type of Visit Will You Be Having? The terms “Inpatient” and “Outpatient” refer to the way your health care is provided. The term “Inpatient” refers to care you receive when you are formally admitted - with a doctor’s order - into a facility. The term “Outpatient,” refers to care that occurs in a facility but doesn’t require you to be formally admitted. Sometimes your doctor may tell you that you are being held for “observation.” Observation services are considered outpatient services. How do I know if I am having an Inpatient Service or an Outpatient Service? Some of the charges displayed in PricePoint may not be covered by your insurance. We encourage you to talk with your insurance company about the services and charges displayed on this Pricing page in order to get a better idea about what your financial responsibility may be. All of the hospital-related data found on PricePoint is collected and published by the WHA Information Center (WHAIC). WHAIC is a wholly owned subsidiary of the Wisconsin Hospital Association. WHAIC was incorporated on October 1, 2003, and began collecting data in January 2004 under a contract with the Wisconsin Department of Administration. WHAIC has collected and disseminated complete, accurate, and timely data about charges and services provided by Wisconsin hospitals and ambulatory surgery centers since 2004. Pursuant to Chapter 153, Wisconsin Statutes, all Wisconsin hospital and surgery centers are required to submit inpatient and outpatient data to WHA Information Center (WHAIC) each quarter. PricePoint uses this data to provide health care consumers with hospital-specific information about health care services and charges in Wisconsin. PricePoint also uses data provided by the Wisconsin Health Information Organization (WHIO) to provide health care consumers with information related to professional, rehabilitation, skilled nursing, ancillary, and pharmacy services that are not part of the hospital facility charges included with the WHAIC data. WHIO aggregates commercial, Medicare Advantage and Medicaid claims data to provide the information used in PricePoint. PricePoint was produced in part by using computer software created, owned and licensed by the 3M Company. All copyrights in and to the 3M™ APR DRG Software, and to the 3M™ APR DRG Classification System(s) (including the selection, coordination and arrangement of all codes) are owned by 3M. All rights reserved. PricePoint shows you charges instead of the actual amounts you will be billed because we can’t actually know the details of your specific situation or who will be providing these services to you – and prices can vary significantly. You may have chosen to go to a specific hospital because you’ve had good experiences there in the past – but that hospital isn’t anywhere near your home town where you’ll be having your rehab appointments and getting your prescriptions filled. Or, maybe your condition has complicating factors and you need special equipment to help with your healing process. It is also important to note that some of the charges displayed in PricePoint may not be covered by your insurance company. Because there is so much variability, we have provided the statewide average charges. It isn’t perfect – but it should give you a good starting point for an informed discussion with your doctors and your insurance company. Wisconsin hospitals have led the country in their willingness to share information on the cost, quality and safety of the care they provide in their communities – making Wisconsin a national model for health care transparency. The Wisconsin Hospital Association furthers that commitment by expanding our PricePoint website to better assist health care consumers, like you, understand the total cost of the care they receive. PricePoint provides hospital-specific information about health care services and charges in Wisconsin – but it goes one step further by also providing information on the professional, rehabilitation, skilled nursing, ancillary and pharmacy services that may accompany the various procedures and treatments performed by the hospital. This gives you a better understanding about all the services that make up your care and how those services contribute to the charges you might see on your bill or in a report from your insurance company. Of course, every patient is different. The actual charges will vary depending on your unique health situation, the specific providers that treat you, your insurance and any financial assistance you might receive for these services. This means the Results displayed in PricePoint should be used as a starting point for an informed discussion between you, your doctors and your insurance company. When you get sick or injured, a lot can go into making you well again. There are many different services you may receive – some from the same doctor or hospital – and some from several different doctors or treating facilities. You might even need medications or therapies to get you back to feeling good again. With everything that goes into your care, understanding the total cost of that care can be a bit of a puzzle. Inpatient Services include care you receive when you are formally admitted - with a doctor’s order - into a facility. The facility could be a hospital, a rehabilitation facility, or a skilled nursing facility like a nursing home or an assisted living center. Rehab and Skilled Nursing Services, which include formal admissions into a rehabilitation facility, a skilled nursing facility, or even a nursing home. Facility outpatient services include care that occurs in a facility but does not require you to be formally admitted into that facility – such as having outpatient surgery or radiology services. Sometimes your doctor may tell you that you are being held for “observation.” Observation services are considered outpatient services because your doctor is not formally admitting you to the hospital. Professional services include care such as visits to your primary care physician, a chiropractor or a dentist. But it also includes services like anesthesia, labs, diagnostic testing and immunizations. Pharmacy services primarily include medications that you may receive as part of your care, but they can also include diagnostic agents – such as injections or drugs that make your body parts show up better during imaging tests like x-rays, CT scans and MRIs. Ancillary services include services like home health visits, transportation, supplies, and medical equipment like crutches, wheelchairs, neck braces and many more. Of course, there are always exceptions. The care you receive may not require services from every group. But understanding the services that can go into your care is a great first step in understanding what it might take to get you well or treat your injury. The PricePoint website helps you better understand which services apply and when – and how those services contribute to the charges you may see on your bill or on a report from your insurance company. It is important to note that some of the services and charges displayed in PricePoint may not be covered by your insurance. We encourage you to talk with your insurance company about the services and charges in order to get a better idea about what your financial responsibility may be. The information provided in your Results can help you better understand how the procedures and conditions you selected in PricePoint translate into actual health care services – and how those services contribute to the charges you might see on your bill or in a report from your insurance company. Of course, every patient is different. The actual charges will vary depending on your unique health situation, the specific providers that treat you, your insurance, and any financial assistance you might receive for these services. It is important to note that some of the charges displayed in your Results may not be covered by your insurance. This means that the Results displayed in PricePoint should be used as a starting point for an informed discussion between you, your doctors and your insurance company. We’ll walk through an example Results page. You can follow along using your own results. While your specific data may be different, the structure will be the same. The first part, located at the top of the Results page, includes the estimated hospital charges for the hospital you selected. The second part, located at the bottom of the Results page includes other services that might be needed as part of your treatment - and the estimated charges associated with those services. Let’s start at the top with the Estimated Hospital Charges. 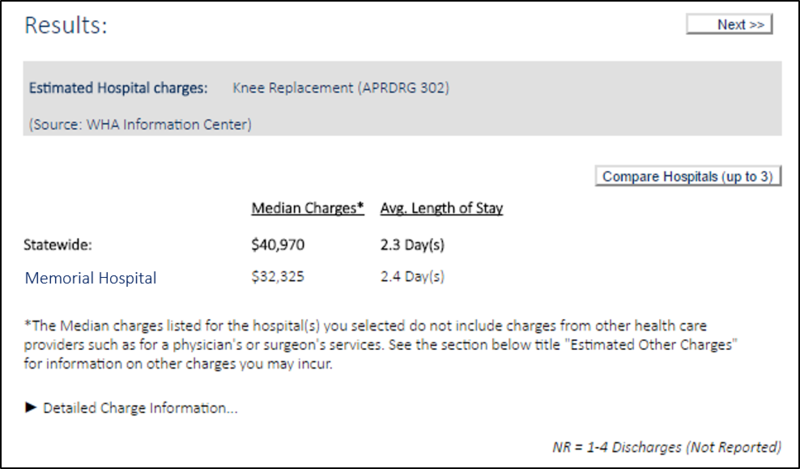 In our example, we can see that the hospital we selected - Memorial Hospital – has a median charge for a knee replacement of $32,325 and that patients that receive a knee replacement at Memorial Hospital can expect to stay in the hospital for an average of 2.4 days. The numbers shown in your Results may be different, but you should be able to locate them on your Results page. If, your Results show “NR,” it means there is not enough data from this hospital for PricePoint to report on the services you are seeking. In this section we can also see how our chosen hospital compares to other hospitals in Wisconsin. The statewide median charge and the statewide average length of stay are shown in the Results to give you a point of reference when examining the information about the hospital you selected. If you want to, you could use the “compare hospitals” button to select another hospital and see how its charges compare to the hospital you selected and to other hospitals statewide. It is important to note that the charges shown are not the same as what you will pay. The amount you actually pay will vary depending on your unique health situation, your insurance, and any financial assistance you might receive for these services. This section provides an overview of the other types of services and charges that may show up on your bill or in a report you receive from your insurance company. It is important to note that some of these charges may not be covered by your insurance. We encourage you to talk with your insurance company about the services and charges displayed in PricePoint in order to get a better idea about what your financial responsibility may be. There are several types of services that are commonly needed when someone has health care. Since these services are not necessarily tied to a hospital, PricePoint provides the statewide average for these charges. This may seem a bit confusing, but patients can receive services from a number of different rehabilitation facilities, pharmacies, laboratories and other health care professionals in conjunction with care that they receive at a hospital. Since there is no way to know for sure where you will receive each of the services you need, providing a statewide average can give you some insight into what the approximate charge may be for each service. 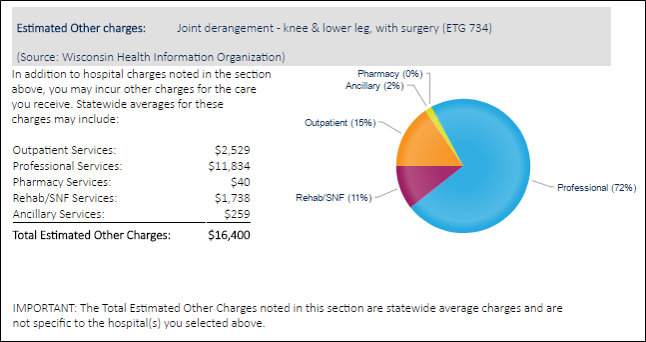 A closer look at our example shows that outpatient services for knee replacements average about $2,529 in Wisconsin. These outpatient services will probably include the MRI needed to diagnose the knee problem and any other outpatient service needed for treatment. The professional services that are typically needed with a knee replacement average about $11,834 in Wisconsin. Professional services could include the services that will be performed by an anesthesiologist during surgery or services from another health care professional, like a sports medicine doctor, a primary care physician or others. In our example, it looks like a knee replacement would require minimal charges for pharmacy services. In Wisconsin, pharmacy services for knee replacements average about $40. This typically covers any medications that may be needed or any dye that was used in an MRI or other test. As you might expect, a knee replacement will require some rehabilitation. If these services are performed in a rehabilitation or a skilled nursing facility the average charge in Wisconsin would be about $1,738. And, lastly, a knee replacement might require some ancillary services. This could include crutches, a wheelchair, a knee brace, or any other medical supplies. It could also include home health services or transportation services that might be needed to get to and from appointments. In Wisconsin, the average cost for ancillary services would be about $259. In the end, the average statewide total charges for all of these other services in our example – not including the hospital facility charges in the top part of the Results - could come to about $16,400. But again - these are charges – not necessarily what the services cost or what you will be billed. You might be wondering why PricePoint shows you charges instead of the actual amounts you will be billed.It is because we don’t actually know where or who will be providing these services to you – and prices can vary significantly. You may have chosen to go to a specific hospital because you’ve had good experiences there in the past – but that hospital isn’t anywhere near your home town where you’ll be having your rehab appointments and getting your prescriptions filled. Or, maybe your condition has complicating factors and you need special equipment to help with your healing process. Because there is so much variability in the costs of these services we have provided the statewide average charges. It isn’t perfect – but it should give you a good starting point for an informed discussion with your doctors and your insurance company. Government programs such as Medicare, Medicaid, BadgerCare and General Relief typically pay health care providers much less than the billed charge. These payments are determined by government agencies. Hospitals have no ability to negotiate reimbursement rates for government-paid services. Commercial insurers or other purchasers of health care services usually negotiate discounts with hospitals on behalf of the patients they represent. Hospitals typically have policies that allow low-income persons to receive reduced-charge or free care. Negotiations between hospitals and health care purchaser generally begin with the charge amount. While each hospital’s charge structure may vary in important ways, charges represent a consistent, though imperfect, way to compare health care costs. Payer mix – As with other businesses, hospitals cannot survive if costs exceed revenues over a long period of time. Government programs (like Medicare, Medicaid, BadgerCare and General Relief) generally reimburse hospitals at rates that do not cover the costs they incur to provide care. Therefore, hospitals that have a relatively high percentage of government-program patients must recover a greater percentage of their operational costs from privately insured and self-pay patients through higher charges. Hospital cost structures – Hospitals differ in their approach to pricing based on operational costs. Some hospitals try to spread the cost of all services and equipment among all patients. Others establish charges for specific services based on the cost to provide each specific service. Furthermore, some hospitals may decide, or be required, to provide certain services at a loss while other hospital operations subsidize the losses. Any of these situations can result in significantly different charges among hospitals for a given type of service. New technology - The equipment hospitals use to provide services differs in age, sophistication, and frequency of use. Staffing costs - Salary scales may differ by region and are typically higher in urban than rural areas. Shortages of nurses and other medical personnel may affect different regions differently. Where shortages are more severe, staffing costs, and, therefore charges, may be higher. Intensity of care - Some hospitals are equipped to care for more severely ill patients than others. Patients within the same diagnosis or procedure category may need very different levels of service and staff attention, causing variation in charges. Range of services provided - Hospitals differ in the range of services they provide to patients. Some may provide the full range of services required for diagnosis and treatment during the stay. Others may stabilize patients and then transfer them to another hospital for more specialized or rehabilitative care. Service frequency – The per-patient cost of services is generally higher if the type of hospitalization occurs infrequently at the hospital. Furthermore, a single case with unusually high or low charges can greatly affect a hospital’s average charge if the hospital reported only a few cases in a given time period. Differences in coding - Hospitals vary in their coding systems and personnel and in the number of billing codes they routinely include on a billing form. This may result in similar types of hospitalizations being classified differently. Capital expenses - Hospitals differ in the amount of debt and depreciation they must cover in their charge structure. A hospital with a lot of debt may have higher charges than a hospital not facing such expenses. Furthermore, hospitals may choose to lease or purchase equipment or hospitals. The choices made about financing of capital projects may affect charges in different ways. If your Results show "NR", it means that there is not enough data from this hospital for PricePoint to report on the services you are seeking.